With another election year upon us, this issue features several articles on politics. 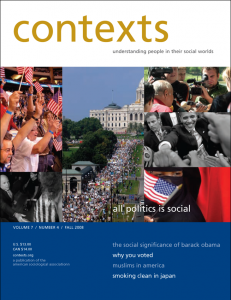 Francesca Polletta writes about political storytelling, Andrew Perrin describes the two faces of voting, and a collection of esteemed sociologists discuss the significance of Barack Obama’s candidacy. This issue also features Jen’nan Read investigating perception versus reality with regard to Muslim Americans, as well as up-close looks at exonerees, the “family values” of Hollywood and the role of gender in politics.